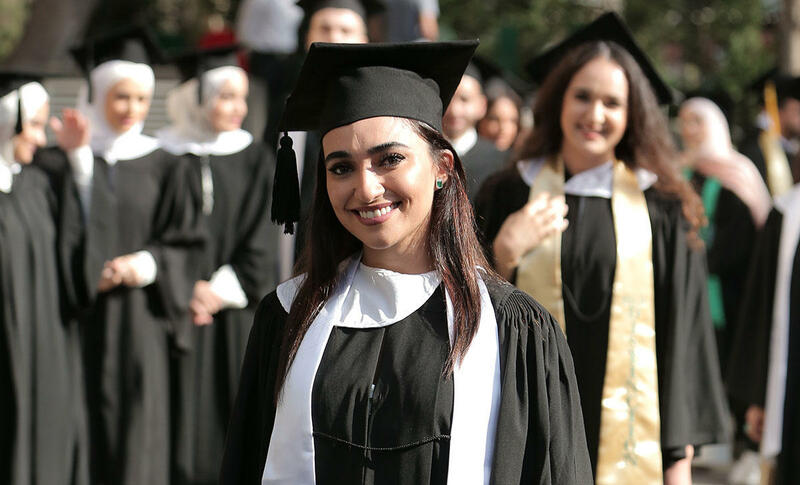 Speakers at the School of Arts and Sciences and School of Architecture and Design’s commencement ask graduates to put their education at the service of their country. “We must always remember to come back,” said valedictorian and President’s Award recipient Ghazi Bou Ghanem. Graduates beam as the ceremony begins. 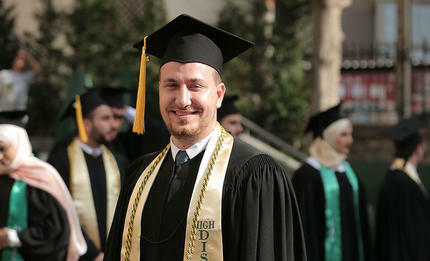 Computer science major Tarek Abdallah received the Riyad Nassar Award for leadership, academic and extracurricular accomplishments. Communication arts major Yasmina El Sabeh received the Rhoda Orme Award for her dedication and service to others. 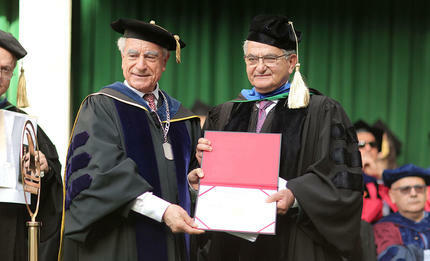 Salim Sfeir, Chairman and CEO of Bank of Beirut, receives the honorary doctorate from LAU President Joseph G. Jabbra. 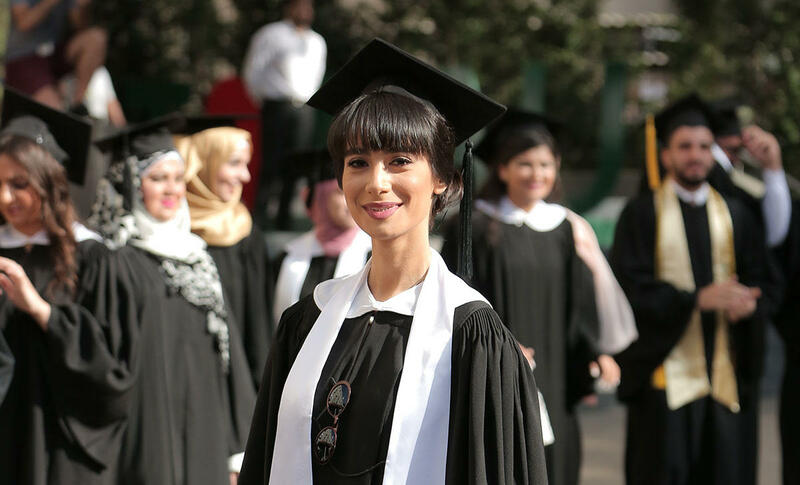 Fashion design major Nour Daher received the Torch Award for high leadership and service spirit. Biology major Anthony Maalouf received the Torch Award for high leadership and service spirit. 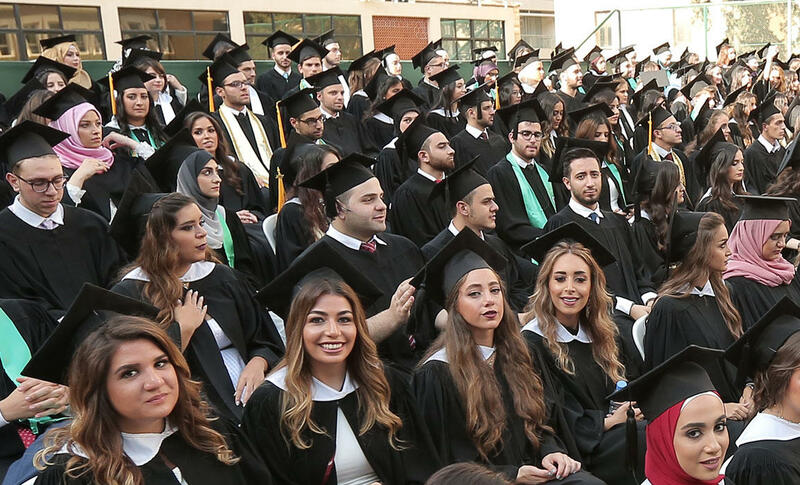 The early summer heat did little to disrupt the enthusiasm of 400 graduates from the School of Architecture and Design and the School of Arts and Sciences as they marched in the blazing afternoon sun at LAU Beirut’s 92nd commencement ceremony. “Don’t give up, be determined and think right… for you are the generation who will breathe new life into our nation and its people,” said Bank of Beirut Chairman and CEO Selim Sfeir, the honorary doctorate recipient. “Don’t think that you are too young to have a role to play — each and every one of you can make a change,” Sfeir said. “And you can not only change your fate but also that of your community, of your country,” he said. A visionary in his field, Sfeir left Lebanon for Canada in 1965 and returned to his home country to start his career. 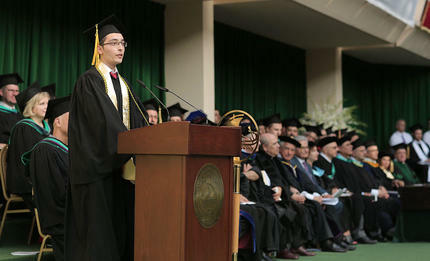 Acknowledging the graduates’ arduous path ahead and first challenge to find a job, he explained that succeeding outside Lebanon was not guaranteed as job opportunities have decreased everywhere. The two fields seeing most growth internationally are innovation and new technologies, he explained. “But you don’t need to travel and leave your country for that; you can be innovators wherever you are,” he said. 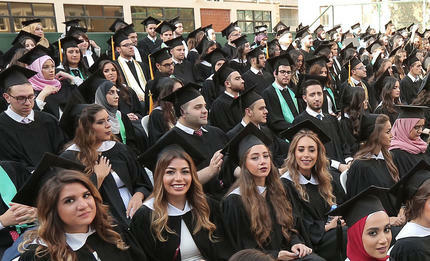 LAU’s class of 2017 was more than ready to take on the ambitious challenge. “We have already been labeled ‘the future’ and this word, as positive as it may sound, also carries with it a great responsibility,” said Ghazi Ousmat Bou Ghanem, a biology major graduating with a GPA of 4.0, in the valedictory. “Fortunately, LAU has exceptionally encouraged us to actualize our potential and to be great citizens of our community,” he said. “This university has provided us with many venues that have enriched our behavior, our attitude, and our understanding of human nature… The seeds of knowledge have been implanted in us by the outstanding faculty who nurtured these seeds. We will go out to the world and see these seeds grow and reap the harvest, anywhere in the world, but we must always remember to come back,” he urged the graduates. 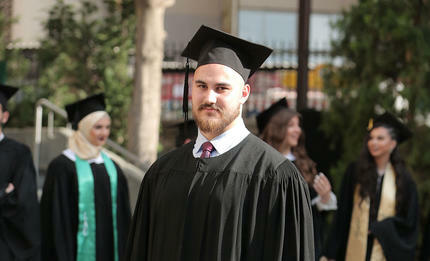 Bou Ghanem exalted LAU’s president, Joseph G. Jabbra, as an inspiring example. “We should follow the steps of our President Jabbra who left Lebanon to actualize his intellectual potential, but did come back to share the harvest with his country,” he said. Look around an interactive gigapixel panorama of the ceremony.